Early March. Quinn and I travel from Colorado to Lovell, Wyoming near the base of the Pryor Mountains. Never knowing exactly what we will find always makes for a grand adventure. Late in the afternoon, we drive out toward the Bighorn Canyon and the Dryhead area of the Wild Horse Range. We cross the cattle guard and turn right into the parking area next to the little lake that empties into the Bighorn River. This is the familiar stomping ground of the mahogany-bay band stallion, Hickok, and his band of six. Hickock family lakeside one year ago. Left to right: Seneca, Quasar, his mother Kitalpha, Kitalpha's daughter Nova, Nova's daughter Prima, and Hickok, father of Quasar and Prima. Only three of the six members of Hickok’s band have been seen for over a month,and I’m anxious to find out where Kitalpha, her son Quasar, and granddaughter Prima might be hiding or whether they have been stolen by a another stallion. I didn’t have long to wait for an answer. Movement! Something light-colored catches my eye on a faraway rocky slope across the lake. I grab my binoculars and focus in. Prima! And as I pan my binoculars around the area above the water, I see cryptic Kitalpha and her son Quasar with Prima. Kitalpha looks bony yet her belly is big. The lake below them is still frozen and ice has buckled up against cliffs, blocking safe passage along the shoreline. Above a fence prevents safe passage up high. For now these three are marooned and from the looks of the spare forage, they are running out of food. Warm weather will melt the ice to reveal a shoreline, but how long might this take? And where is the rest of the family? There is still enough light so I follow a hunch and drive to the bottom of Sykes Ridge and onto the red dirt road that leads to Sykes Spring and Seep, a favorite watering place for the Hickok band. Hickok! I spot the handsome red bay trotting to his right, and as I glass over, I see his older mare Seneca and then Nova, Kitalpha’s red dun daughter. All three look great and I notice that Nova looks even more pregnant than her mother! Seneca eyes the distant car suspiciously: her life-long aversion to people has not diminished with age. She takes off with Nova following her and Hickok racing to catch up. I have only seconds to take a handful of pictures before they disappear over the rim and into the desert hills below. I worry that the band is divided and wonder how long it will be before the ice melts and Kitalpha can lead Quasar and Prima to the safety and the companionship of her band. We let the BLM know of the problem these three face. Then, just before Linda Hanick and I return in early April, we learn that Ryan, who works for BLM, has encouraged Kitalpha, Quasar, and Prima to cross the melting ice to safety. Way to go Ryan! We also learn that Nova has given birth! John and Linda Nickle of the Pryor Mustang Center found a newborn filly in the low hills near the gate of the range. Linda Hanick and I are determined to find the reunited family and their newest member. Early April. Linda Hanick, Quinn and I arrive in the afternoon and drive out to the range on the paved highway. We’re disappointed to find no horses around the lake or on the nearby hills. We continue into the range along the paved highway stopping to glass at the pullouts. Nothing. Finally, stopping above Mustang Flats, we see an unmistakable orange spot in an opening surrounded by a sea of junipers. Blizzard, I say to Linda. The flashy, almost 16 year-old and his band have been hanging out here all winter. Near Blizzard’s band we can see other horses and decide to take a hike. We identify Seattle’s grullo son, Johnston, with his new family: Morgana, Icara, her blue roan son, Phantom, plus a new member of the family, Cloud's granddaughter, Niobrara. The brown roan filly grazes peacefully within a few feet of Johnston. She likes him, I think to myself. The pretty four year-old daughter of Firestorm and Jackson, and the entire family for that matter look remarkably well, particularly for this time of year. Not finding Blizzard near Johnston, we hike up a high hill. There he is, I say to Linda. We laugh at how close the apricot dun and his family are to Johnston. It’s amazing how easily horses can disappear amongst the junipers and small swales. When we are close to Blizzard we confirm that Cascade, the long-time friend of Blizzard’s dark grulla mare, Baaken, is still missing. I hold out hope she may be with Fiero who also lives down here but it is also very possible the hard winter did her in. Blizzard looks a little thin but the rest of his band, Baaken, La Nina, and her son, Pax are in great flesh. The month before I wondered if Blizzard would kick the coming two-year old colt out as he bit at Pax’s neck and back. But now, all seems quiet and Pax is still nursing his young, “semi-willing” mother. It starts to spit snow as we get great looks at him. Look at those stripes! His father is likely Hidatsa, who also sports bold, primitive markings. Linda and I hike back to the car and creep down the road toward the main gate, stopping a dozen times to glass, hoping to spot Hickok's family and the new filly. Late in the afternoon we drive over to Sykes Spring where I had seen Hickok, Seneca and Nova last month. No luck. The next day produces no sightings of Hickok’s band. Blizzard and Johnston are still on Mustang Flats. When we start driving back toward the main gate, not 50 feet from the road, we spot Fiero. His two mares, Strawberry and Sacajawea, are far away and want nothing to do with us. Cascade is not with them and we must now assume that like so many others in the past year, she has died. Unlike his two skittish mares, handsome Fiero is kind enough to hang around for a photo session. Linda and I are still bent on finding the first born foal of the year. We hike to the car and begin driving back along the paved road. Miles later, to my left in an area of burned junipers among live ones, I see a flash of light. The light is moving. I pull over and we reach for our binoculars. “It's Prima,” Linda says. "I saw the band here a month ago," I respond excitedly. Linda, Quinn and I get out and begin hiking. We circle the area, rather than heading straight at them. 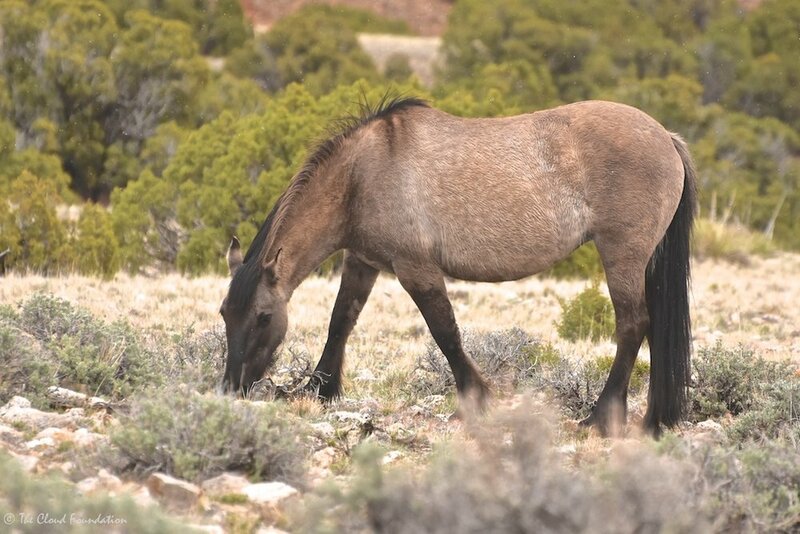 The worse thing is to catch wild horses by surprise, especially a mare with a new foal; and even more so with a cautious mare in the band like Seneca. We spot Prima again, still some distance away. She is following her mother Nova and the new foal! At this point we leave Quinn, sliding his leash handle over a sturdy snag. “Wait here and we’ll be back,” I scratch his ears and Linda and I move out. Quinn knows the drill and before we are even out of sight, he calmly lyes down in the shade of the juniper. As we near the band we stop, waiting quietly, hoping the foal will make an appearance. The band still hasn’t spotted us. They stop and the foal inspects her surroundings. When she moves into a small opening, I begin shooting. What a doll, I think, snapping away. Nova looks up and we freeze. She sizes us up for a minute and we hold our breaths. Then Nova goes back to foraging, trusting we’ll not try to get too close to her baby. The foal's name is Rigel Starr, following the celestial theme of her mother, Nova, sister Prima, and Grandmother Kitalpha. Rigel, (I pronoun it ree-gel) is the second brightest star in the constellation, Orion—almost a supernova. And the name is also in honor of her Grandmother Belle Star, who is Hickok's mother, the aunt of Cloud. Rigel Starr is a sturdy filly with what looks like a starburst on her forehead. By our trip’s end, Rigel and her family have moved back to the lake area. Good luck little girl I think as we drive away. The little filly is glowing red. Then it hits me. Hercules! I should have put her color together before now. She is not a red dun like her mother but a sorrel. . . like her great grandfather, Hercules. He is the first horse I ever saw in the Pryors back in 1994 and he lived right here on the hills around the lake. Hercules is the great-grandfather of Rigel and the grandfather of Cloud. Life truly is a circle! Early May. Just last week, Jesse Daly (our operations manager and the fellow who makes things work at TCF!) and I found Rigel Starr and her band across from the lake. Spring has certainly sprung in the Pryors, and Rigel has certainly grown. Above, her big brother Quasar teases her while her father, Hickok, and mother, Nova, graze. When we last saw them the band was appropriately silhouetted against the western sky. Goodnight bright star! I said to myself as we drove away. western wildlands increases. Please consider donating what you can to help us fight for Rigel and her family and all our wild horse families so they might live their lives in precious freedom! P.S. Coming soon: The Adventures of Encore!